As you probably know, the people of Ireland recently voted to remove the right to life from their constitution, paving the way for laws allowing abortion. It's estimated that this vote will cost the lives of 14,000 Irish babies every year. The pro-life movement in Ireland, the United States, and elsewhere is in mourning. The pro-choice celebrations sting. The feelings of righteous anger clash with our commitment to non-violence and love, leaving nowhere to direct that anger but inward. What could we have done differently? What do we do now? I'm still processing my emotions, and of course, this is primarily a story for Irish pro-life advocates to tell. I will just offer one thought, speaking specifically as an atheist. Save the 8th wisely ran a secular campaign. Supporters of the right to life articulated the progressive case for protecting preborn children as defenseless members of our human family. The Catholic Church largely sat out of the debate. a sign reading "Separate church & state"
But that wasn't enough to erase the longstanding historical association in voters' minds between opposition to abortion and Catholicism. More than one headline, including in the New York Times, described the vote as a "rebuke" to the Catholic Church. What if Catholic priests had never molested children? Or what if Rome had responded quickly, fiercely, to the scandal and turned the offenders over to authorities rather than covering it up? What if the Catholic Church had offered compassionate care to unwed Irish mothers and their children? 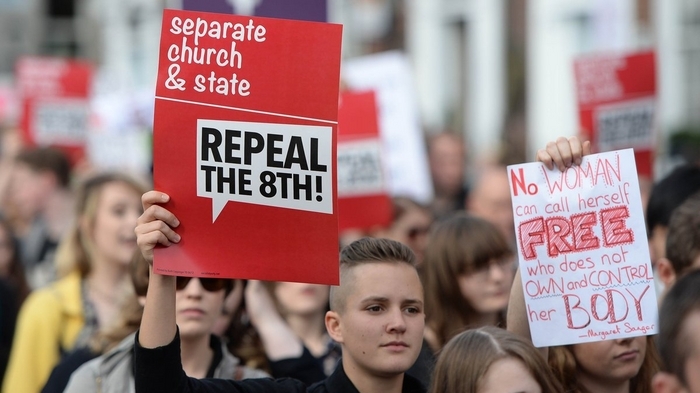 Would the 8th amendment still be in place today? To be clear, no amount of horrific misconduct by the Catholic Church justifies voting for abortion. The truth is the truth even when terrible people tell it. Unborn children are blameless. Babies are people, not things to be destroyed in retribution. But it seems clear enough that the desire to punish Catholic officials was a factor in last week's vote. Now, children in the womb will pay the ultimate price.